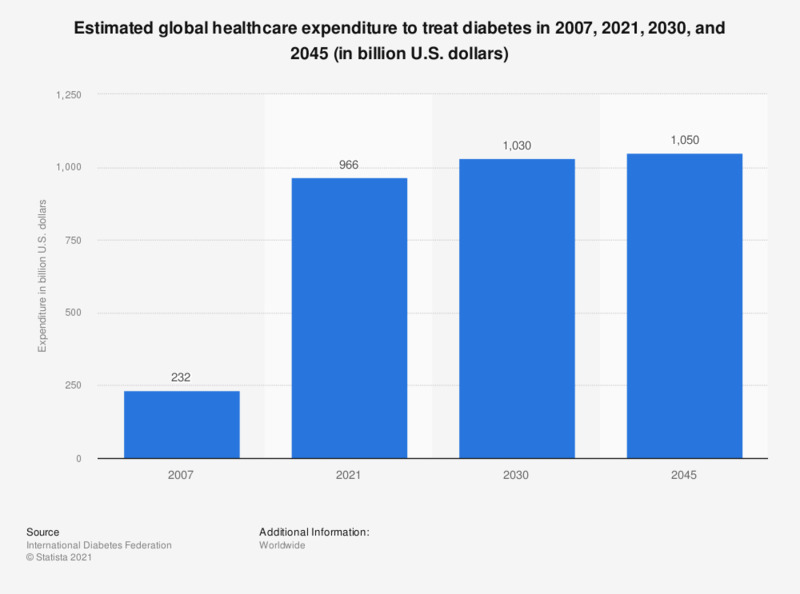 Between 2017 and 2045 the global expenditures for diabetes treatment is expected to grow from 727 billion U.S. dollars to 776 billion U.S. dollars. Diabetes can have life-threatening cardiovascular, renal and nervous system consequences when left untreated. Diabetes is one of the leading causes of death worldwide. Diabetes is a chronic illness that affects the pancreas’s ability to produce insulin or how the body uses insulin. Insulin is a hormone that acts on blood glucose levels. There are several types of diabetes including type I, type II and gestational diabetes. Diabetes can be treated through daily insulin injections and/or oral medication. Diagnosis and monitoring of diabetes can be done through blood glucose monitoring. Recent studies indicate that among all regions, Africa and Southeast Asia have the highest percentages of undiagnosed diabetes globally. Among all countries worldwide, the United States and China have some of the highest diabetes medical expenditures. When compared to one another, the United States had diabetes health care expenditures almost three times higher than China in 2017. Despite these two countries sharing the highest expenditures for diabetics, they are not the countries with the highest spending per patient. Norway has the highest health care expenditures per diabetic patient as of 2017.